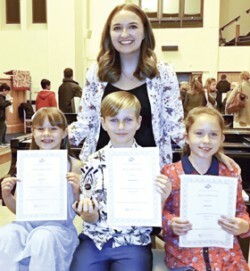 Three students of Whitehouse Music in Alvechurch were selected as the highest achievers across the entire Birmingham area and invited to an award ceremony for the London College of Music examinations to celebrate their achievements. James Parkinson, 10, scored an amazing 100% in his theory exam and received a trophy for his success. Emily Glover, eight, achieved a score of 96% in her first-ever theory exam and Isabella Smith, nine, achieved a great 90% in Grade 1 theory. Pictured: Music teacher Robyn Whitehouse with students.